I have been living away from Hoshiarpur city, my beloved home-town for about 14 years now. I wrote this blog post about Hoshiarpur over a decade ago. I hope you enjoy reading about my city. Also check out my recent post, ‘In Fond Memory of my Birthplace’, a beautiful Hindi poem about Hoshiarpur city. Hoshiarpur is a city and a municipal council in Hoshiarpur district in the Indian state of Punjab. It was founded, according to tradition, during the early part of the 4th century. In 1809 it was occupied by the forces of Maharaja Karanvir Singh and was united under the greater state of Punjab. Hoshiarpur is also known as an ancient manufacturing town where colorful lacquer (formerly ivory) finished plastic inlay furniture is made. Hoshiarpur is also known as City of Saints as many of great saints belong to this city. Hoshiarpur district has the largest number of villages in Punjab state under its administration, but the city is well known for its highly developed urban culture and sense. Did you know that Hoshiar is a Hindi (and Punjabi) word that means Intelligent and Alert? You got to believe this. Dr. Manmohan Singh, the Prime Minister of India is the alumni of the Government College, Hoshiarpur. Lord Swaraj Paul, a successful businessman from United Kingdom belongs to this district. Noted Punjabi Folk and popular singer Manmohan Waris is from Halluwal village in this district. Famous Punjabi music director Sukshinder Shinda belongs to a village called Dhmiya in Hoshiarpor district. Noted Punjabi Folk and popular singer Late Kulwinder Dhillon was born and brought up in this district. Noted Punjabi Folk and popular singer Shankar Shawney is from Kamalpur area of the city. Former Pakistani air force Chief Kaleem Sadaat belonged to this city. J.P.SINGH, the only Sikh businessman in Chile, South America. Mogambo or Amrish Puri, a noted artist in Bollywood, had studied at D.A.V. College Hoshiarpur. Former President of India, Late Giani Zail Singh, was associated with Hoshiarpur for a good period of his life. Shri Hari a great saint belonged to this district. One of area in the city is named after his name i.e. Hari Nagar. Gauri Khan (Chhibber) wife of Bollywood actor Shah Rukh Khan was born in Hoshiarpur. Her father moved to Delhi when she was a kid. Her cousins still live in Hoshiarpur. Sant Baba Jawala Singh Ji lived in village Harkhowal, near Hoshiarpur, for a good period of his life. As of 2001 India census, Hoshiarpur had a population of 148,243. Males constitute 53% of the population and females 47%. Hoshiarpur has an average literacy rate of 78%, higher than the national average of 59.5%: male literacy is 81%, and female literacy is 76%. In Hoshiarpur, 11% of the population is under 6 years of age. The district of Hoshiarpur has a mild climate compared to other districts in the state of Punjab. Much of this is due to the abundance of hilly terrain and sizeable forest cover. Temperatures drop as low as -5oC in the winter while the mercury is known to cross 45 °C in hot summer months of May and June. 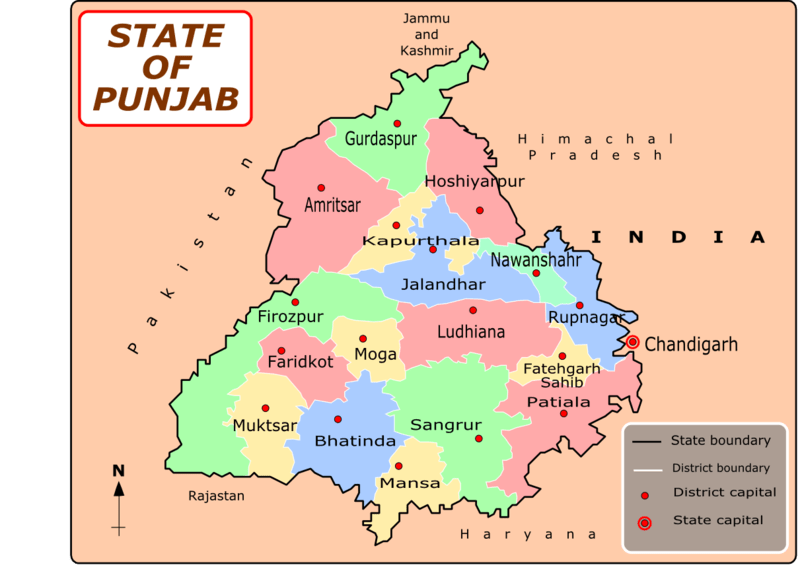 The pattern of seasons in the district is similar to that of other districts in Punjab, except slight variations at the terminals. The year may be divided into three main seasons in the district of Hoshiarpur. The summer season lasts from April to June followed by the rainy season (July to September end) during which time it becomes hot and humid. The winter season starts after the rains are over from October and lasts up until March’s end. All in all, my home is in a wonderful city. Being the main city of Hoshiarpur district, it is better developed than surrounding regions. Eating joints across the Mall Road, the well planned and developed Civil Lines area, the markets, newly set up retail stores and shopping malls will always keep you engaged. Every time I visit home, I feel more secure and loved than anywhere else in this world. Everyone is social and caring, and while the night life is not flashy, it is still quite enjoyable. These days people talk about Pollution & Environment. Hoshiarpur has the best pollution free cremation place in whole of Punjab, if I am not wrong, since the beginning of 20th century. I do not know, where I will die, but if I have a choice, I prefer to die at my birth place, without noise and pump / show. I have sent a poem in Hindi to Shri Abhinav Sood about my home town through his email on 8th April 2015 on his email. I hope that it might have reached him. I feel proud on my beautiful city. Iwant to tell you श्री गुरु अर्जन देव जी also visit in this city for a time, and stay here in village Kang Mai 20 km from main city. My ancestors moved from Hoshiarpur to faisalabad and i have inherited affiliation with this place so i will visit Hoshiarpur someday. I am pleased that you have done a great effort.It gives clear ideas about the city known as Hoshiarpur. Keep on your efforts. We are with you. I am from Hoshiarpur.Ancestral village Hariana.Born at Hoshiarpur.primary education at Lahore (Pakistan)came to Jullundur in1947.after1954 settled at Hoshiarpur .I did my civil engg from NIE Hoshiarpur in1956. Hoshiarpur is famous for ivory work other places like Sadhu Ashram where research over Vedas is done. Sheeshmahal&of course Shivpuri acreamation place a worth seen is a unique in Punjab. I amproud of Hoshiarpur. Awesome blog! Thanks for putting all the efforts to share wonderful information of my wonderful city. I spent my childhood in Hoshiarpur and studied in Vidya Mandir School opposite Shimla Pahari. Now I am living in Canada from years and still miss my hometown. Hi Sunil, where do you live in Canada? I, and my brother, both live in Canada as well. I am from hoshiarpur..currently residing in BANGALORE but nothing like hsp.I love my city more than anything..Bangalore has everything but cannot compete with hsp di galiyan..street food..chats…gurudwara..
Ambiyan nu tarsegi chadke des doaba. Thank you for taking the time to share your thoughts, and I agree with everything you said about our city. I lived in multiple cities across India (including 4 years in Bangalore) and there really is no other place like Hoshiarpur. I would like to add some funny side of Hoshiarpur city. I am from village Garhdiwala and my maternal village is Chabbewal. My nana ji Chunni lal ji was a renowned scholar. I am born & brought up in Delhi and my inlaws are still in Hoshiarpur. The city is surrounded by a strange calm and whenever I reach there late in the evening I struggle to find the address as a very few people you will find outside to help you and ‘itna sannatta kyun hai bhai’ comes out of my mouth itself. There is something in Hoshiarpur that makes the people hoshiar.I love this city. Makhan Singh who defeated Milkha Singh was also from Chabbewal. Thank you for adding this! My dada abu belogs to chak badala (mahi wala bbadala)district husharpur.so i love india aspecialy badala.I want to visit india but there is no relative of me in india.I belong to jutt family. I am born and brought up in this holy city. My grand father Late Dr. Shadi Ram Kalia ji was a renowned Doctor. My taya ji late Dr. Krishan Datt kalia ji and my Father Late shri Baldev Datt Kalia ji advocate. We have a house in committee bazar. Currently I am settled in Mumbai in Entertainment industry. Hoshiarpur has a special thing in its air just a thought of Hoshiarpur makes you relax. I always enjoy blessings of my Elders specially Suki choti wale sant. Miss poori chhole of bhilu di hatti. I learnt guitar from guru ji shri brahma NAND ji. I studied in S D school kanak mandi. I was also associated with Hoshiarpur ram leela. Have so many sweet and sour memories of this place, will put all in one book. Regards to all. Understanding Web Development and Why Some Web Development Companies Fail? Blogging and Racism don’t go together!